Review Guilty, your honour. In mitigation, I would like to assure the jury that I do not automatically adore everything with Apple branding on it, nor have I any intention of jacking off over a Steve Jobs biography. 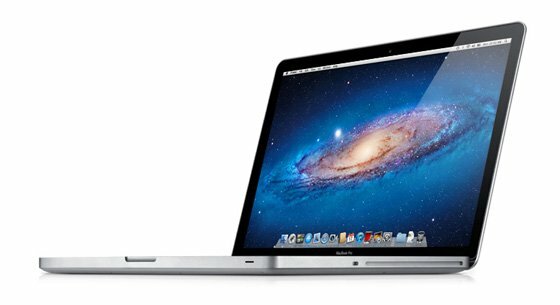 I just happen to like the current range of Apple MacBook Pro notebook computers, that’s all. Is it such a crime? So here I am, dressed in stripes and manacled to a 10-foot thick wall in Register Hardware’s dungeons, reviewing yet another MacBook Pro. This time, I’m determined to be sour, po-faced and negative, otherwise the readers will press for a death sentence. And I remained negative right up to the point at which I turn the computer on. As I bring the Apple power plug towards the MagSafe socket, it leaps magnetically into it. I open the flush lid and push it right back, yet the tilt-free MacBook Pro remains glued to the surface of the desk. When I press the on/off button at the top-right of the keyboard, the casing does not creak, nor does the computer make a stupid farting noise as it starts up. This is not just any notebook computer, as Marks & Spencer might say. MacBook Pro: an open and shut case. Ho ho! Did you see what I did there? What we have here is a gently upgraded version of the 13in MacBook Pro that was last updated in February. This entry-level model has an Intel Core i5-2430M processor that’s just 0.1GHz faster at 2.4GHz and is fitted with a 500GB hard drive to replace the previous 320GB unit. In line with Apple convention, however, the price remains the same. Apart from the enormous Apple logo on the lid, there is nothing vulgar or tacky about the design. Everything is plain and coolly understated, from the overall flatness of the closed computer to the consistent black-and-aluminium styling of the screen and keyboard, and even to the complete lack of any hideous and unnecessary sticky labels celebrating the fact that your notebook has components inside it. DVDs and CDs are slot-loaded from the right edge. All the ports are ranged along the left edge. There’s not much to look at. There’s nothing to snap off and nothing that looks as if it could fall off. Sod M&S, this is certainly not just any notebook computer, it really isn’t. Sure, FPGAs don't make much cash, but they might soon? Defense insists there's nothing to return. And those Perl files? Purely sentimental.